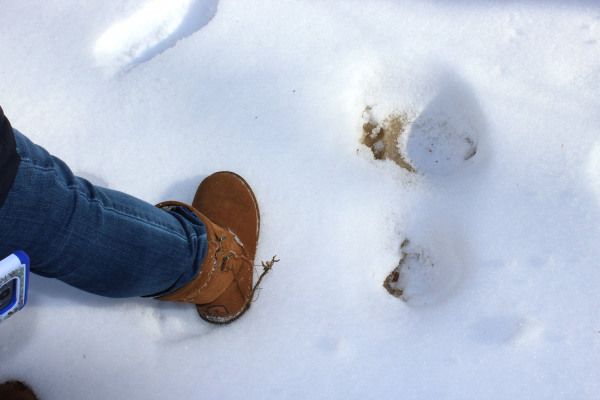 Bigfoot Prints in the Snow? 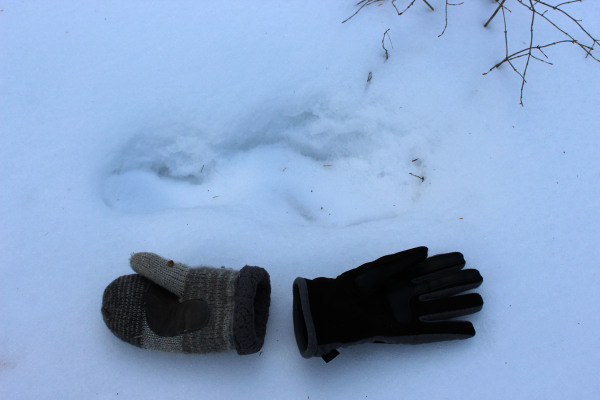 SquatchHERS search for Bigfoot in all seasons, and winter, with it's cold, snow, and ice, are one of our favorite times to search. 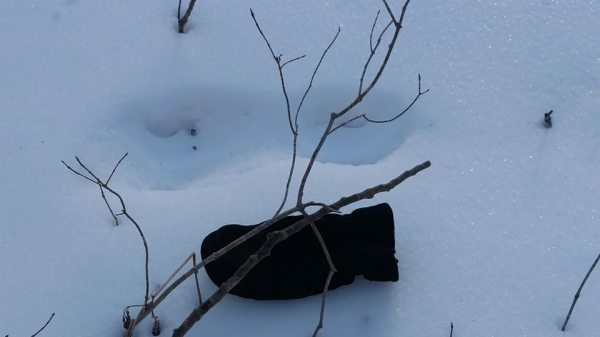 Last February found us deep in the Chippewa Forest searching for Bigfoot. We found what we believe to be Bigfoot prints. Unlike any prints we have seen before in the snow, the prints were some 3 to 4 feet apart and many measured 22 inches in length. The path was unusual in that the prints were in a straight line, not like humans or any animal we know of. Links to the facebook videos we posted from that day are here below! 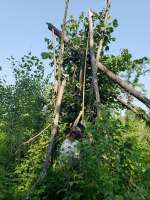 Stick structures are a highly debated subject; some believe squatches build these structures, while others do not. The structures are not for cover or protection from the elements, i.e. a hut of some kind, rather they are strategically placed sticks forming a teepee formation, and in most cases they are well off the beaten path and deep in the woods. We have discovered hunter's blinds clearly constructed by humans for the purpose of cover while hunting, these structures are clearly different. What would Bigfoot use these structures for and why expend the energy to build them? We think perhaps they serve as location markers - a kind of Bigfoot street sign, or for a gathering area, perhaps even some kind of ritual area. We just don't know, but after discovering many of these structures that we believe are not man made, we are intrigued. In August 2018 the team was searching deep in the northwoods and discovered a structure that was enormous. 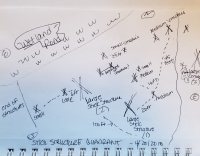 One of the things we look for is if the sticks were chopped with an axe or saw, which would indicate man made, and all the stick structures on this page have sticks that have been broken, and intentionally placed to build the structure. 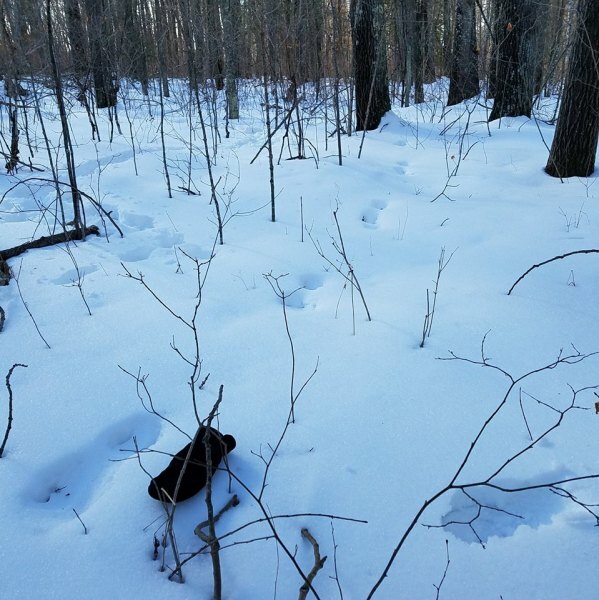 Last March, Heidi, Katie, and Stephanie were searching in a heavily wooded DNR area north of the Twin Cities Metropolitan area and came across many stick structures. While the first one we found may just be a hunter's blind, the others found further north about a mile are very interesting, and would serve no purpose to humans. The Stick Structure Quadrant is a current and ongoing project for us; we visit the area often and find something added to the structures each time we visit. We mapped out the quadrant, and a photo of that, other photos, and videos below.